A diamond Certificate from DGL means your diamond has been subjected to highly scientific evaluation by a distinguished team of gemologists using State-of-the-Art instrumentation to assure you the most accurate assessment of the diamond you are buying. Official DGL certificates include a letter-sized certificate with a detailed diamond report. 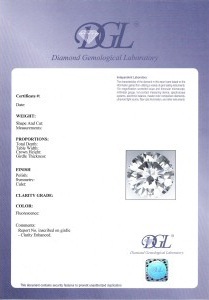 A standard DGL certificate includes the following parameters: DGL unique certificate number, certificate issue date, diamond weight in carats, shape and cut, diamond mm measurements, diamond proportions (depth, table width, crown height, girdle thickness), diamond finish grading (polish, symmetry, culet), clarity grading, color grading, fluorescence.